sea shopping. Simius Playa Hotel is ideal for couples of all ages who like discovering every day a different bay, corner of paradise located along the southeastern coast by car. The family management will make you feel at home. A few minutes walk from the Hotel Simius Playa from the center of the lovely town of Villasimius, one of the most famous tourist centers of Sardinia. The coast of Villasimius is known for its beauty, its clear waters and its white sandy beaches, which make it one of the most popular destinations for those who choose a summer holiday in Sardinia. 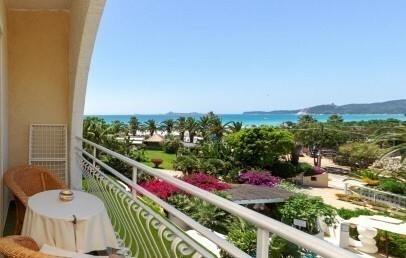 Hotel Simius Playa overlooks the sea of Capo Carbonara, in the beautiful beach of Simius from which it takes name. 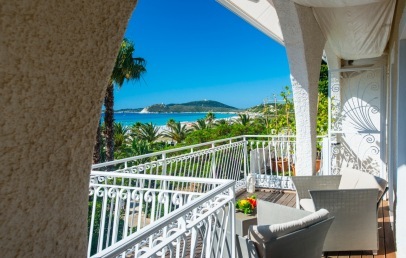 The Hotel Simius Playa is an historic hotel in the heart of Villasimius offering a friendly and elegant service. The atmosphere is friendly, attentive service and on time. It is surrounded by large green spaces, numerous balconies and flowers which give a touch of color and joy to the structure. 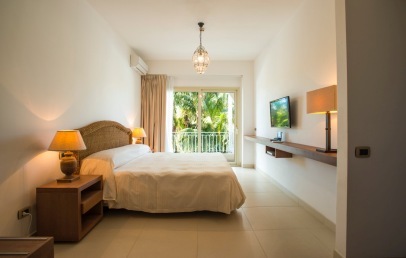 The rooms and suites at Hotel Simius Playa are in total 46. All are comfortable and overlook the sea or the garden surrounding the hotel, most having a terrace or balcony. 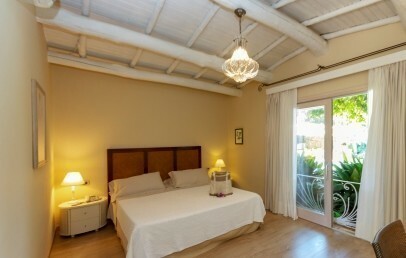 The rooms are furnished in Mediterranean style with colonial and oriental touches, bathroom with shower, internet connection. Classic – ideal for two, view on the backside of the hotel. Superior – located on the upper floor with garden view or on the ground floor with pool view. 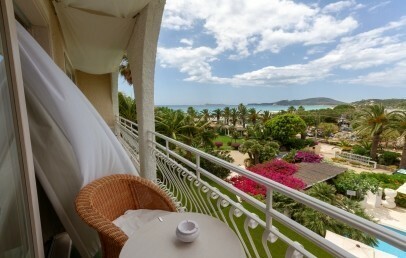 Superior Lateral Sea View – located on the second upper floor with view lateral towards the beach. 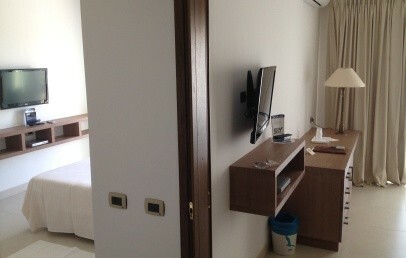 Junior Suites – with two separate rooms (bedroom and living room). 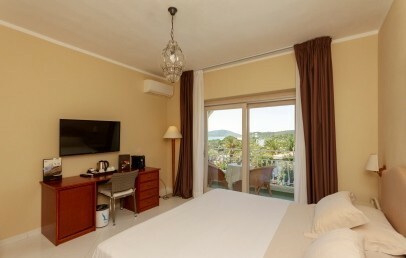 Suites and Suite Sea View – with bedroom and living room. Pleasure Suite – with large terrace overlooking the garden, bedroom, living room, shower and whirlpool. The restaurant of the Hotel Simius Playa is considered one of the best of Villasimius. The delicious land and sea recipes, are to be found in traditional Sardinian and Mediterranean tradition. On your table you'll find specialties produced by the Hotel: organic wine, olive oil, vegetables, honey and oranges. Lunch is served al fresco in the garden, but breakfast and dinner are prepared in the large panoramic terrace, under the starry sky which characterizes the summer nights in Villasimius. The American Bar awaits you in the afternoon or after dinner for a cocktail or an aperitif. For dinner on August 14th (Ferragosto), the hotel may apply an extra charge for guests staying on half board. The white sandy beach with beach service is just in front of the Hotel Simius Playa. Hotel guests can relax in the private pool, surrounded by tropical gardens, or engage in other activities: there is a private tennis court a few meters from the hotel and there is the possibility to rent bicycles, cars, scooters, trips, horseback riding, diving, water sports. Private parking for customers, Internet Point and wireless Internet access throughout the hotel, Baby sitter are just some of the services offered by the Hotel Simius Playa. Beach service is included (starting from the third row) for guests who have booked in half board. 1st and 2nd row on the beach are with a supplement. Please note: the 1st beach towel is included in the beach service, each other towel change is due to an extra charge of 3,00 euro. Tourist tax – The municipality of Villasimius requires the payment of € 4,00 per person/overnight (excluding children under 10 years) to be paid on spot. Subject to changes. 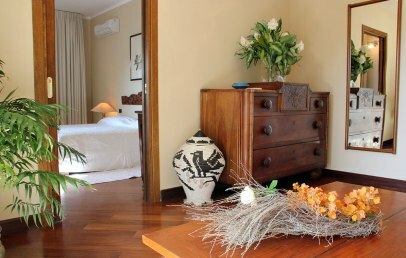 The rooms are furnished in a fresh, Mediterranean style, with a touch of colonial or oriental style furnishing. 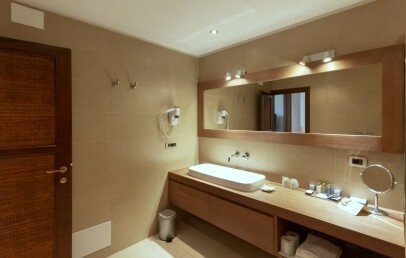 The bath room, however, is modern and possesses a shower, a hairdryer and toiletries. Classic rooms, ideal for two people, overlook the back of the Hotel. They are located on the upper floor with balcony or ground floor with a large window on the pool side. Comfortable and spacious Suite carefully furnished in a Mediterranean style, with a touch of colonial and oriental furnishing. The Suite has a large double bedroom, a walk-in closet and a separate living room. 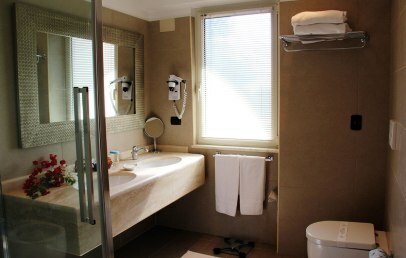 The modern bathroom has a shower, hairdryer, bathrobes and complimentary toiletries. The Suite offers a lovely view on the garden. The wide and silent double rooms are furnished in a fresh, Mediterranean style, with a touch of colonial or oriental style furnishing. The bath room, however, is modern and possesses a shower, a hairdryer and toiletries. 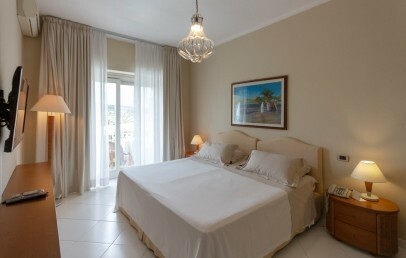 Superior rooms with sea side view are located on the second floor with a side view on the beautiful Simius beach. The refined style and the quite atmosphere will welcome you in the best way. From the balcony you can enjoy both views of the sea (lateral view) and the swimming pool and taste your drink enjoying the scent of flowers. The wide and silent double rooms are furnished in a fresh, Mediterranean style, with a touch of colonial or oriental style furnishing. The bath room, however, is modern and possesses a shower, a hairdryer and toiletries. 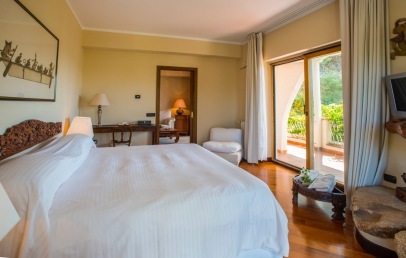 Superior rooms are located on the upper floor with garden view, or ground floor by the pool. Large rooms, fresh and peaceful atmosphere and refined style will welcome you. 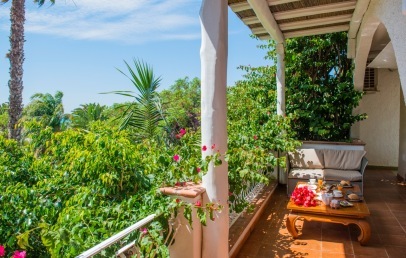 From the balcony you will enjoy an amazing view of the tropical garden, with its palm trees and its beautiful flowers, or the hills or on the pool. 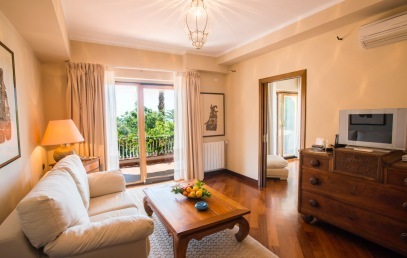 The refined and exclusive Suites are furnished in the Mediterranean style, with a touch of colonial or oriental style furnishing or are characterized by modern furniture. The bath room, however, is modern and possesses a shower, a hairdryer and toiletries. The Pleasure Suite has a big terrace with garden view. 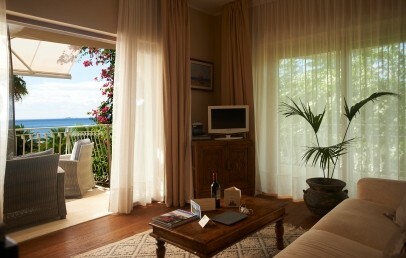 Junior Suite are located on the second floor with a side view on the beautiful Simius beach. They also overlook the tropical garden and the swimming pool. Composed by a bedroom and a living room, they offer you the opportunity to enjoy your holiday in total privacy with your partner, your family and your friends. The bathroom is modern and has a shower, a hairdryer and toiletries. 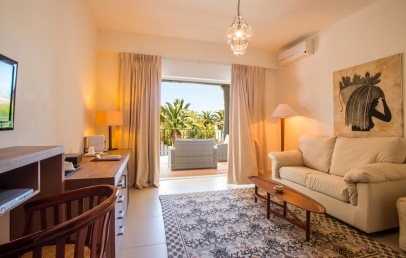 Comfortable and spacious Suite carefully furnished in a Mediterranean style, with a touch of colonial and oriental furnishing. The Suite has a large double bedroom, a walk-in closet and a separate living room. 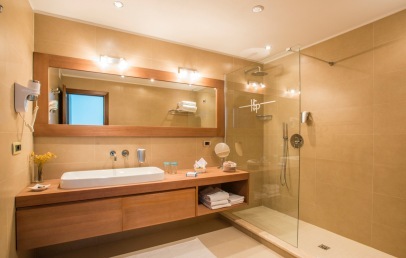 The modern bathroom has a shower, hairdryer, bathrobes and complimentary toiletries. The Suite offers a lovely view on the sea.